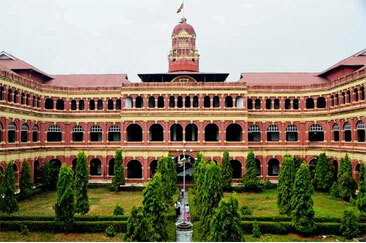 A classical Victorian structure complete with a redbrick outlay and arches lining the verandahs, the Secretariat’s facade is imposing. The pilasters are Corinthian style, complementing the grand pediments. 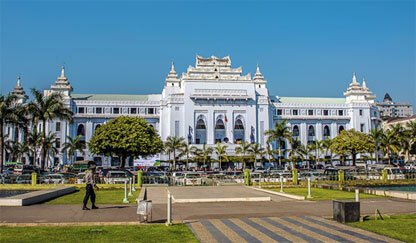 This is the grandest of the colonial structures in Yangon. Located in the downtown area, next to the Sule Pagoda, Yangon city hall is an impressive Burmese style building with tiered roofs called Pyatthat, topped with hti (a ceremonial umbrella). Flanking the arched entrance are two Nagas, serpents from Buddhist and Hindu mythology, guarding the hall. The building was completed in 1936 after 10 years of construction. 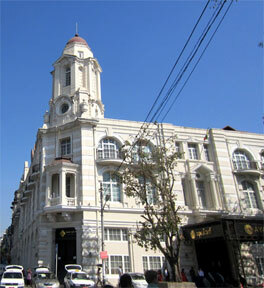 Now the headquarters of AYA Bank, the Rowe & Co building was completed in 1911 and housed one of largest department stores in Southeast Asia. In the 1960s, the building was overtaken by the government and turned into the immigration office until 2005. The defining features on this Victorian style building are the arched windows and central domed tower, which sits at a 45 degree angle from the street. 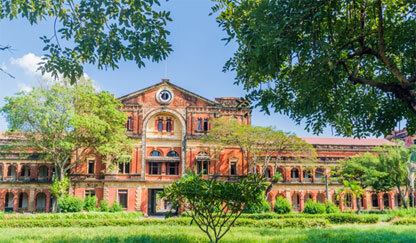 This is a neo-Classical, Victorian building located in the heart of Yangon across from Independence Park. Completed in 1911, this Queen Anne revival structure housed the British court and then until 2006, the Supreme Court of Myanmar. The beautiful quoins and its domed clock tower exemplify its elegance. 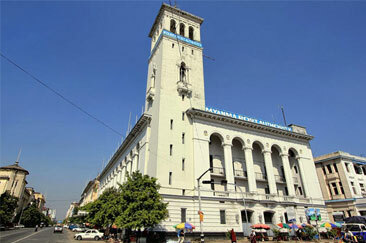 Formerly the headquarters of the Irrawaddy Flotilla Co., the Myanma Port Authority building was once the headquarters of second busiest port in the world, after New York City. This structure is of neo-Classical style, with Corinthian columns stretching the length of both sides of the building. Formerly known as the Scott Market, this Victorian structure was built in the early 20th century, with the centered dome and triple pediments standing out as key features. Also, you’ll see the centered balustrade and opposite end arch designs are quite unique. After the Burmese government moved the capital to Naypyidaw in 2005, many of the colonial era buildings were abandoned. However, there are efforts to restore them, led by the Yangon Heritage Trust with a goal of promoting and protecting Yangon’s past, while advising on restoration, and creating a plan for Yangon to be one of the most livable cities in Southeast Asia. In 1852, the British seized much of Burma including Yangon and made the city the Burmese capital in 1885. 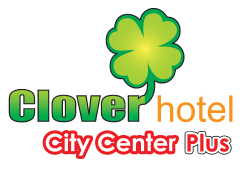 They constructed a great number of grand, majestic, impressive buildings in Victorian, Art Deco, Queen Anne, British Burmese and Neoclassical style. 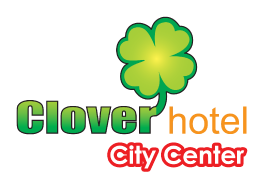 As a result of Burma’s over decades isolation, the city remained much like it was since the end of the 19th century, especially the old business district near the Yangon river. 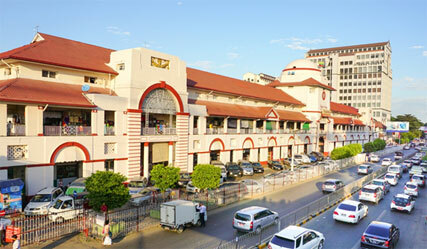 Of all South East Asian cities, Yangon has the highest concentration of colonial buildings in the world. Opened in 1902 now known as the Minister’s Office, the Secretariat held the entire British administration of colonial Burma from its opening until 1938, and then for three more years from 1945-1948. 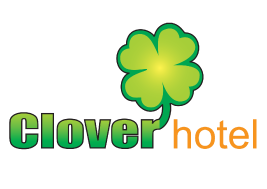 Copyright © 2019 Clover Hotels Group​​. No. 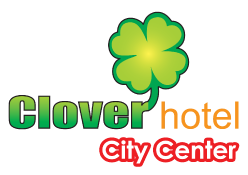 217, 32nd Street (Upper Block), Pabedan Township, Yangon, Myanmar.